A team of experts from LASP at CU-Boulder has been awarded $6.7 million from NASA to design, develop, and test instruments for the fastest space probe ever built. The probe will orbit 22 times closer to the sun than Earth, and well inside the orbit of Mercury, to better understand how the sun ticks. Robert Ergun, LASP scientist and CU professor, is leading the LASP team that will design and test key components of the mission’s electrical and magnetic field instruments, including the spacecraft’s antennas and the onboard signal and data processing hardware. The LASP-CU effort is part of the Fields Experiment, which is led by the University of California, Berkeley; the package will measure electric and magnetic fields, radio emissions, and shock waves traveling through the sun’s atmospheric plasma. Ergun said, “This has been more than 20 years in the making. It’s time for us to sharpen our pencils and refine our designs for what has finally become a real mission.” LASP Research Associate David Malaspina is a co-investigator on the effort. 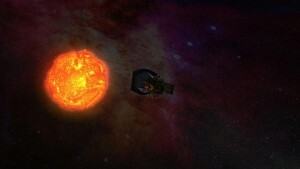 The mission, a small-car-sized satellite known as Solar Probe Plus, is slated for launch in 2018. The probe will take five years to reach its closest orbit of the sun—zipping to within four million miles of it—in a region that has never been visited by a spacecraft. The satellite will be equipped with a high-tech heat shield to protect it from searing 2,550 degree Fahrenheit temperatures. The mission should help scientists to better forecast the radiation environment in which future space explorers will work and live, according to NASA officials. At its closest point to the sun, the spacecraft will be traveling at 400,000 miles per hour—more than 100 miles per second. The major question the Solar Probe Plus team hopes to answer is what drives the solar wind, a stream of charged particles whipping off the sun at millions of miles per hour that eventually affects the solar system and Earth, said Ergun. Another important question the scientists hope to answer is why the sun’s corona—a region of plasma surrounding the sun that is visible during solar eclipses—is hotter than its surface. NASA is funding five proposals selected for Solar Probe Plus, including the Fields Experiment, for $180 million. The cost includes preliminary analysis, design development and tests. The four antennas that will be riding on the spacecraft as part of the Fields Experiment are each expected to be about 8 feet long and will be placed on each corner of the square heat shield and will be exposed to the sun, said Ergun. After launch, the spacecraft will make several flybys of Earth and Venus before setting out for orbit around the sun. The flybys will help to slow the spacecraft down and allow it to be inserted into the correct, elliptical orbit around the sun, said Ergun. In addition to LASP-CU and the University of California, Berkeley, other participating institutions in the mission include the University of Minnesota, Goddard Space Flight Center in Greenbelt, Md., and the Paris Observatory. For more information on the Solar Probe Plus mission visit http://solarprobe.gsfc.nasa.gov/. To view the NASA press release announcing the awarded investigations, visit http://www.nasa.gov/home/hqnews/2010/sep/HQ_10_208_Solar_Probe_Plus.html.